As your grips are the main point of contact for controlling your bike, they are more important than people think. A feeling of control and comfort will give you more confidence in your riding. You have two main types: General slide-ons and lock-ons. As the name implies, lock-ons actually clap onto the handlebars to avoid any slippage. If you used to have slide-ons on your BMX as a kid (we all had Mushrooms!) you will remember how they used to slide around and twist off. What are the best bike grip brands? In our opinion, the best MTB grip brands are Ergon and RaceFace. This is based on all the mountain bike grips we have tried and tested among our team and the brands we have stuck with. What are the most comfortable grips? It’s not always the grip thickness that gives you the comfort. Quality of material and technology of the build is more important. Read the reviews below and see what’s right for you. What type of pattern is best? Pro riders may argue for a specific pattern, but an average rider should not do too much research. A decent brand will feel great, whatever the pattern. 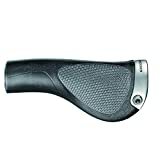 Saying that some well-designed grips have dedicated pattern groove channels to remove sweat. What size are MTB grips? The standard size for mountain bike grips is 130mm, but you can buy smaller or larger sizes depending on your requirements. 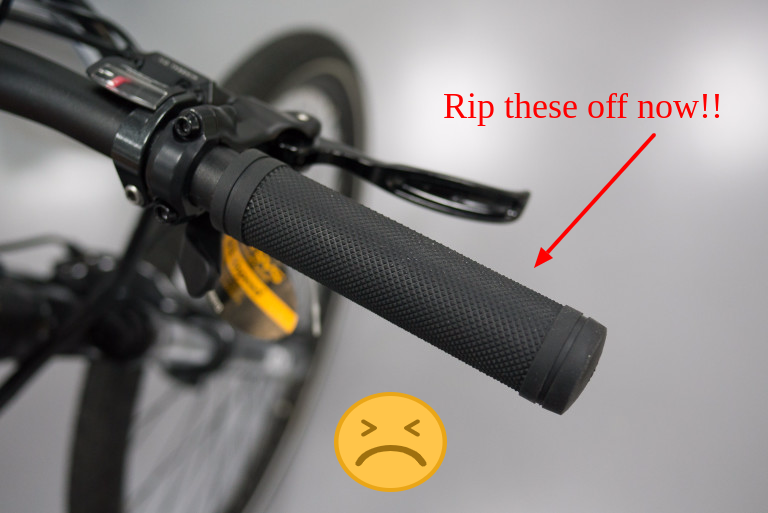 How do you remove old mountain bike handlebar grips? For this, you will need a flat head screwdriver and a lubricant. Pop off the end caps and insert the screwdriver between the handlebar and grip. Lever the grip rubber up and squirt the lubricant under the grip. 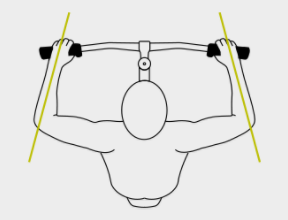 Work the lubricant around by wiggling the grip and it should slide off with ease. Recommended lubricants: WD40, hairspray or alcohol-based products. We’ve seen people saying Vodka also works! So which are the best mountain bike grips on the market? Here’s our pick of the best MTB grips money can buy. 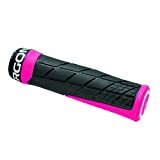 Ergon is one of the top brands for MTB grips and has a huge range of amazing grips. They have won countless awards and accolades for their innovation and engineering. The GE1 series of MTB grips were developed from pro rider feedback after the Enduro World Series. The grip material is even more slip-proof and designed to make your elbows point outwards when doing fast downhill track. Lizard Skin specializes in mountain bike accessories and bike protection gear. They have their own manufacturing plant based Utah, USA and have a loyal following in the MTB world. These are lock-on grips with double clamps (included) great rubber and pattern and comes in ten different colors. RaceFace is based in Vancouver, Canada and specializes in mountain bike components and accessories. 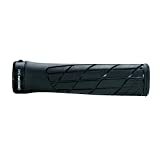 These MTB grips are single lock meaning they just have one collar that locks to the handlebar. The grips are super slim but really comfortable and use RaceFace’s Vexy rubber which has a sticky feel. The grooves in these bike grips are not just for style, they are actually sweat channels to remove moisture. 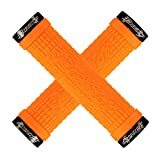 Currently, 80% of reviews on Amazon for these grips are 5 stars. Another popular, best-selling mountain bike grip brand – Odi. These lock-on grips are single clamps and made of Odi’s high tech rubber which slip free material. The total length of these mtb grips is 130mm, weigh 99g and come in five different colors. Anti-vibration, large pad design eliminates numbness and slipping for any size hand. The extremely soft rubber will give you excellent control and maximum comfort. Handsomely detailed design adds beauty to any bike. Made in the U.S.A.
Oury is another US based manufacturer, but only makes grips for mountain bikes and BMXs. These grips have large padded squares which are said to stop hand numbness, reviews by other buyers have stated they do work well. Comes with double clamps and screws, and easy to fit onto your MTB handlebars. Every serious mountain biker knows the Spram brand, they make some of the worlds best parts and used by pro riders. Not many know they actually make MTB grips too. These grips are low cost and come with a single clamp and end plugs. We have one pair of these in the office and found them easy to fit and comfortable to ride with. Designed by Andreu Lacondeguy and are extra long with a total length of 143mm. These grips are munufactured by Odi in the uS. Chromag Bikes is a Candian based company who make a range of mountain bike parts and accessories. 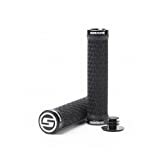 These mountain bike handlebar grips have great anti-slip due to the moisture channels which take the sweat away. The grips are lock-on with double clamps to stop any movement. The Palmskin is made of Chromag’s proprietary rubber which has a sticky texture for added grip. The grips come in 3 different color schemes below.